I tried aqua jogging a few years ago. I hadn’t run for almost two years due to my hamstring injury. While I was bicycling and swimming, along with taking a Pilates class, I knew that any strength, endurance, power and form that I’d had from training for and running a marathon before the injury had disappeared. One day, while swimming laps at the local pool, I noticed a local college student moving back and forth in his lane in the deep water, almost upright. We chatted as we stopped at the deep end to take a break. He said he’d had recent knee surgery and wasn’t allowed to do any impact exercises, so his track coach suggested aqua jogging. I was intrigued. I started to research aqua jogging and, while finding no one definitive source of information (except the several referenced below), I was able to piece together enough data, anecdotes and YouTube videos to add aqua jogging to my repertoire of exercises and cross training alternatives. After my initial jump into the deep end a few years ago, I recently returned to pool running after the Portland Half Marathon in October. My chronic hamstring injuries had flared up with spiking pain that was exacerbated by pounding (i.e. running on land). I wanted to give them a rest while trying to maintain a semblance of the muscle memory I’d developed this past year. I couldn’t find my aqua belt, likely lost in one of our many moves these past few years, but fortunately, my pool had some available. You don’t need all these accessories, but you do need this good form to effectively aqua jog. The requirements for aqua jogging are minimal: swim suit and access to a deep pool or lake or ocean; you want to be able to move without your feet touching the bottom. If you only have a shallow body of water available, you will have some impact from your feet pushing off from the pool bottom, but you can adjust the exercise accordingly. I’m fortunate to have several municipal swimming pools within a few miles of my house that are each at least eight feet deep. I generally aqua jog during “lap swim” times, using a full-or-half lane to move back and forth. At first, I felt awkward about using a lane for jogging and not swimming, but after seeing an occasional other aqua jogger, decided that it was fine. Check with your local pool or YMCA or fitness club for what they recommend. You really don’t need any other equipment, but for beginners, especially, it is important to maintain buoyancy and correct form. An aqua belt or other flotation device is helpful as it allows you to concentrate on form without worrying about sinking. Some people tether their aqua belt to the side of the pool to help with form or to help stay in one place, especially if you don’t have a lap pool. Like running on land, form is critical to running effectively and without injury in deep water. Your running form is similar in water and on land, although your center of gravity is different (your center of gravity is the hips on land, while your center of buoyancy is your lungs in water). In water, focus on your body angle, slightly forward of vertical (where the water line is the horizontal axis and your body the vertical axis), with your head above water. Relax your muscles; all of them! Swing your arms from the shoulder in a relaxed position (sound familiar? ), elbows close to your side, swinging elbows back then forward. Do not let your arms cross your body. Try to reach out with the leading leg and pull it through the water strongly and evenly. The trailing leg needs to be actively pulled forward (because of the increased resistance of the water) at the same time. The front foot should land in front of the body’s center of gravity. Keep the knees low and actively dorsiflex the rear foot at push-off. Running in water is usually slower than running on land due to the water resistance, although you can increase your intensity over time as you improve your form, range of motion, or effort expended. It’s impossible to measure miles run in a pool. Although some runners seem overly obsessed about converting aqua jogging to “miles” for their training logs (based on comments on some blogs and websites), think about time and effort spent in the water in seeking some equivalency with land running. Stride length and stride rate are different in water than on land because there’s no effective way to measure miles. Because of water’s resistance, a greater effort is required to move forward in the water than on land. This equates, to me, to think about time in the water and effort expended (are you gently moving your legs in almost a standstill position or are you using full range of motion and greater effort to move forward in the water, building/maintaining your aerobic capacity as well as speed work?). You will find some conversion information based on time, for example, if you run three miles at 10-minute/mile pace on land, you’d try aqua jogging for 30 minutes for rough equivalence. The “faster” you jog in water, the better your aerobic capacity. A very good source for understanding and measuring “perceived rate of exertion” in water versus on land is from David Brennan’s methods and programs. He considers exertion based on cadence and rates of perceived exertion using a scale of 1 (very easy) to 5 (very hard, e.g., sprinters). He provides sample workouts using your rate of perceived exertion (effort) and time in the handbook referenced above. A workout that I like because it provides variety, and can easily be modified depending on the exertion I want to achieve, is this: five-minute warm-up (slowly walking in the water from shallow end to deep end, increasing speed slowly to a slow jog while focusing on form); repeats of increasing jogging intensity (e.g. 1:00 minute medium intensity, 30 seconds slow, 1:30 minutes medium intensity, 30 seconds slow, and so on up to 5:00 minutes medium intensity, then back down the ladder); five-minute cool-down (almost walking speed to shallow end where feet touch the ground). You can “Google” aqua jogging and find that elite runners and run of the mill runners alike use aqua jogging to maintain strength and endurance, especially when injured. Deena Kastor ran on an underwater treadmill (likely not available to most of us) while training for the 2005 Chicago Marathon when injured. Lauren Fleshman has blogged about aqua jogging during her recovery from surgery. I posed the aqua jogging question to some women runners recently (261 Fearless Ambassadors) and received a number of responses to when they might use this form of training: broken foot at the start of marathon training, stress fracture in foot/toes, after an ankle surgery. I like to swim laps, generally a mile or so, yet spending an equivalent amount of time on the pool aqua jogging can be boring. Not sure why! Mixing up the workout by doing intervals or changing exertion levels helps keep me focused. Some people use waterproof ear buds to listen to music or podcasts. Some pools have music playing (the lifeguards must get bored, too, don’t you think?). I might think about projects on which I’m working, what research I need to do, reworking sentences in my mind, and coming up with new running posts! Still, even though you may be bored, try to stay focused on your form, breathing, and the intensity of leg cycling to maintain the benefit of aqua jogging and preventing injury. Before you begin or consider aqua jogging, you might want to discuss it with your physician or physical therapist to determine whether it will help or hinder your recovery and/or training. Have you tried aqua jogging? Did it help you maintain your fitness? Did you find ways to create workouts to keep you mentally engaged? 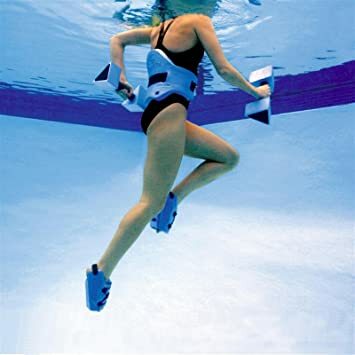 Did you use aqua jogging as part of your cross training routine? Previous 2015 Race Report Contest – Win Your Favorite Running Shoes! Great article with lots of good information! I have done a lot of aqua running at various times, especially when injured, and it has definitely helped me maintain fitness. I have a waterproof iPod shuffle (the company Waterfi sells these), which really helps make the time pass. Also, if you have access to a pool with a dive well (many high school and college pools have these), this is a great place for aqua running as they are deeper, usually aren’t used much (especially during off-peak times) and you don’t have to navigate the lap swimmers. Throw in different forms (like long-stride cross-country and backwards running) to mix things up as well. Thanks, Rebecca. Once, taking a water aerobics class,we practiced backwards and sideways motions, which are also helpful in mixing up the routine. Probably good for hip strengthening as well. Here’s a good article my coach wrote on aqua running: http://www.libertyac.org/aqua-running-forms-and-workouts/ I do use the gloves, too – they definitely make the workout more challenging! This article is SO helpful; wish I’d had it before. Your coach’s illustrations and perceived efforts conversions are very helpful. I’d forgetten about the cross-country form that I’d done in aqua aerobics. Will definitely keep this as a resource. Thank you. Yup, that’s about my limit! Hi Sage, great post! This actually makes me want to try aqua jogging again. I did it years ago when my running partner was injured while we were training for a half together. I went along to keep her company and for solidarity. But now that I think back – I’m not sure we were doing it correctly (I don’t know that we were in the deep end, I think we might have been walking where we could tough the bottom of the pool). Thanks for all the great links and resources here! I think the low impact is so important especially for me: some times I feel like swimming, other days aqua jogging. It’s nice to have the options. I started this year periodically doing water running when I felt I needed the break from the impact of running. I go to the pool during lane swim and most of the time have been lucky that it hasn’t been busy. Today I went and was surprised by the number of people swimming. I told the lifeguard that I felt guilty going in the slow lane because even the slowest of swimmers will be faster than an aqua runner. Since there were only 5 lanes (all busy) I asked if I could swim just outside the lane swim area. The life guards kindly let me do that, even though that part of the pool was technically closed. I just made sure to stay immediately beside the last open lane. It was nice not having to worry about the other swimmers. I do admit that I still feel a little self conscious, but then remind myself that it really isn’t any stranger than swimming back and forth over and over. I will admit though that an hour is all I can handle, to boring after that! The lifeguards are usually very accommodating. I wouldn’t worry about speed…some swimmers (myself sometimes when I’m only doing the breaststroke for movement, not speed or aerobic practice) are slow. I like to do a couple of pool running laps after a swim. The resistance of the water really helps me build some strength in my core and arms. It’s not exciting, but I try to focus on form. A lot of elite runners we know will pool run as their second workout on an interval day rather than a 2nd easy run. Mostly for recovery and strength. The kickboard is a good option too. I really hate it, but it gets up your heart rate and works the leg muscles. It helps when my hamstrings are tight. I am training now for the LA Marathon and am on a training plan that still includes 2x swimming per week. I always have to end the workout with a few laps of the kickboard. I hate it, but it feels good after, like I am stretched out more. I have the toughest time with the kickboard but now I need to do it more. I like the combination lap swim and aqua jog! I have benefited from dwr since the mid 1980’s. I use a flotation belt and several resistance tools on my legs, feet and hands. Two months before the Boston Marathon in 1991 I broke 3 toes and could do no weight bearing exercising so the pool was my track, and long run with perceived hills. Be careful with leg striding because dwr is an “open chain” exercise so hyper-extending the leg at the knee can cause injury. I use a MP3 enclosed in 2 small zip lock bags fastened to a head band and water resistant ear buds for entertainment. It works great! I use minutes as my dwr/land based runs equivalence. Thanks, Ron. I am trying to incorporate weekly aqua jog into my training.